I think that new year eve is one of the best evenings at the year. This evening I always get together with some really good friends, eat some great food and just have a good time. My new year’s eve is packed with many good traditions. We always spent the afternoon cooking a delicious three course dinner and then spent some hours eating it. After the dinner we make some nice drinks, play some games and just have a good time. 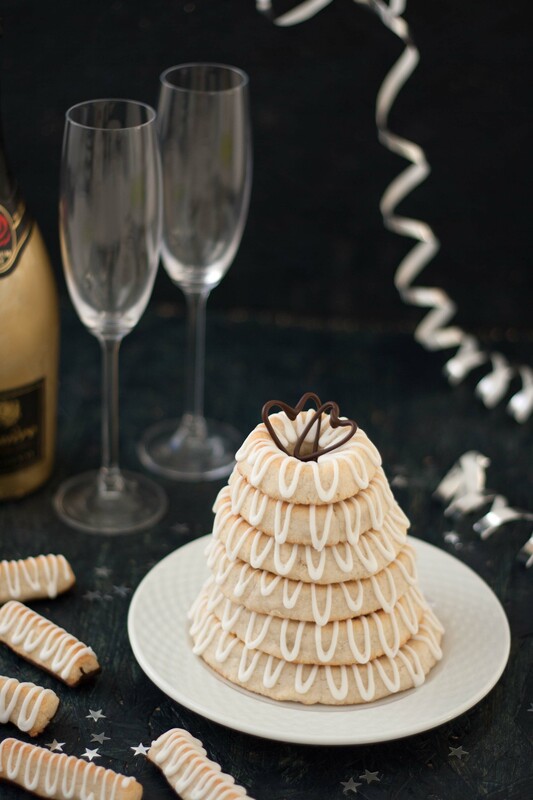 At midnight we have some champagne and eat some Kransekage – Kransekage is basically a marzipan cake shaped in rings, decorated with icing and assembled on top of each other. 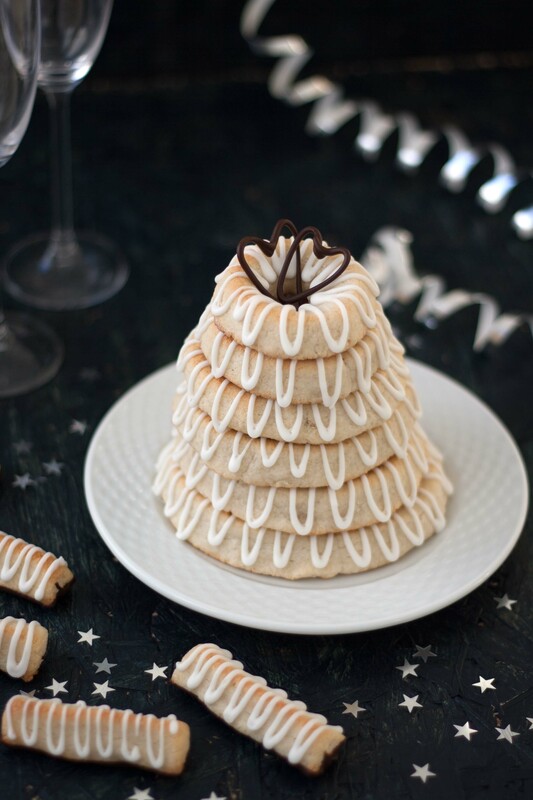 The cake is very famous in Denmark and Norway and for a lot of people it is a great tradition at new year eve. The cake is mostly eaten at new year eve but it can also be served at weddings or other special occasions. The marzipan rings has a crisp crust and a soft and moist inner core. This recipe for a marzipan ring cake with icing is easy to make, it is very delicious and it is a lot cheaper than the ones you can buy from the supermarket. The cake only consist of three ingredients, marzipan, sugar and some egg whites. 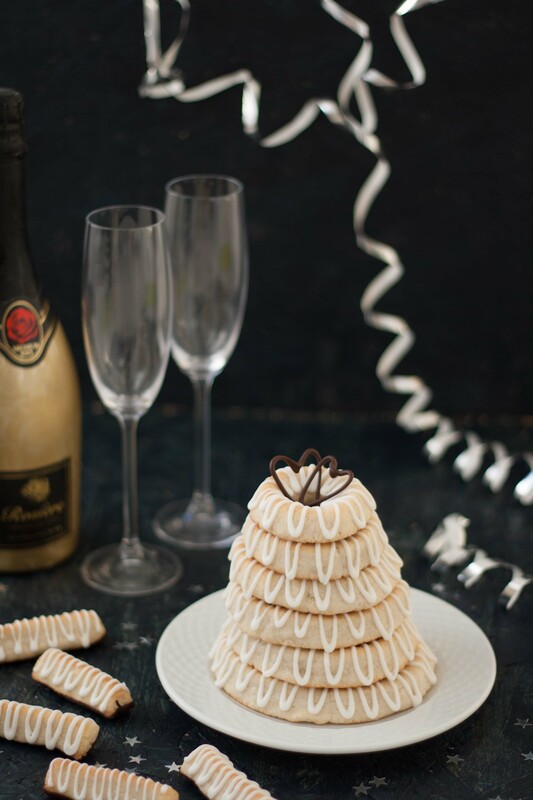 Serve this cake with your favorite champagne. Step 1: Whip well the egg whites and the sugar using a fork. Let it rest for minimum 15 minutes, however 30 minutes is preferred. Step 2: Divide the marzipan into smaller pieces and put it in a large bowl. Add the egg white/sugar mixture little by little and knead well until it has a uniform and smooth consistency. It is normal that you don’t have to use all the egg white/sugar mixture. Step 3: Cover the bowl with some plastic wrap or aluminum foil and place it in the fridge for minimum half an hour, however longer is preferred. Step 4: Roll out the dough into two equal sized bars 60cm (24″) long. Step 5: Cut the first bar into 3 pieces each with a length of 15cm, 18cm and 27cm (6″, 7″ and 11″). Step 6: Cut the second bar into 3 pieces each with a length of 12cm, 21cm and 24cm (5″, 8″ and 9.5″). There is a little extra piece of dough, roll it into a small cone for the top of the cake. Step 7: Assemble each of the bars into rings and place them on a baking tray lined with parchment/baking paper. Step 8: Give each of the ring a gently push, using two fingers, making them a little pointy at the top. 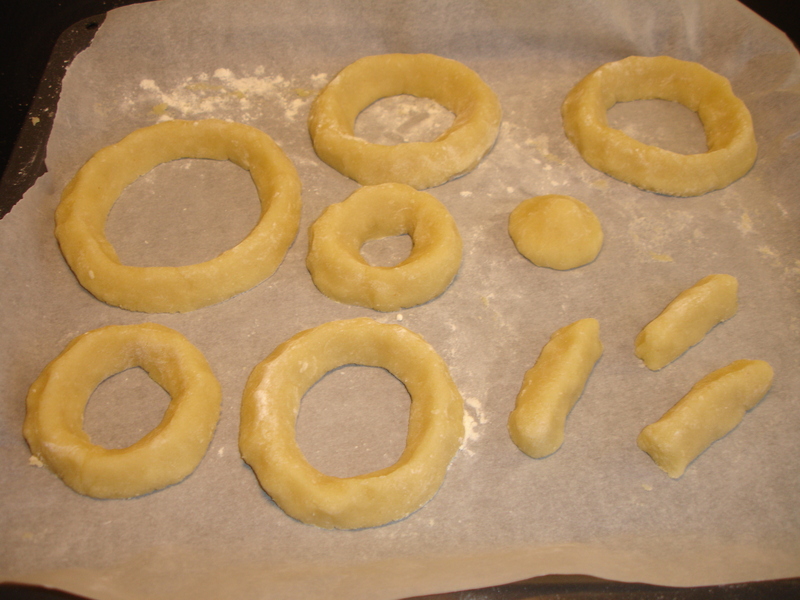 Step 9: Preheat the oven to 200 C (400 F) and bake the rings at the center position for about 10 minutes. They should only get a little light-brown colored at the top and bottom. The baking time is highly depended on the size of the rings so keep an eye on them. 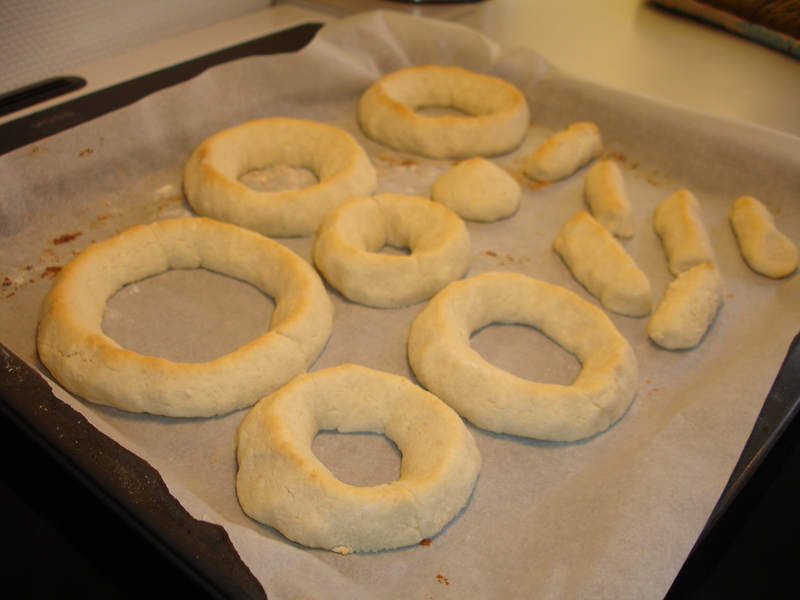 Step 10: Let the rings cool off a bit before you move them too an oven grid for the final cooling off. Step 11: When the rings are completely cooled off you can decorate them with icing. If you have the time make the rings two days in advance, bag them in a plastic bag and store them in the freezer before you decorate them. This will only make the rings even more moist and delicious. Step 12: Whip the egg white, white wine vinegar and powdered sugar together into a chewy and firm icing. Pour the icing in a plastic bag or similar and cut a small hole at one of the corners. Use your hands to press out the icing through the small hole. Use it to decorate the marzipan rings in a classic zigzag-grid. Step 13: Assemble the marzipan cake (Kransekage) starting with the largest ring and moving upwards with smaller rings. 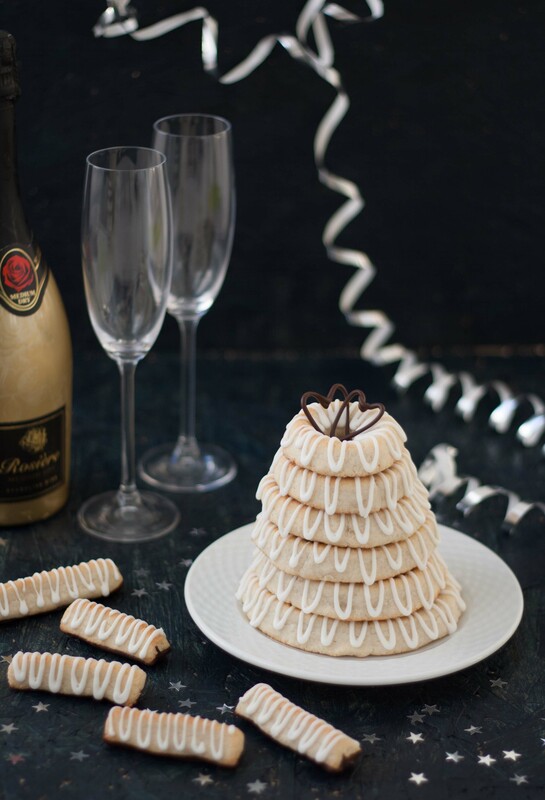 Tip: Serve the cake at new year’s eve with champagne. You definitely can consider I will be making this marzipan ring cake for the upcoming Christmas season.. Not only does it look impressive but I bet it tastes even better! I tried your recipe for Kransekage and they went flat like a pancake. Did not hold their shape… Please help me in what I am doing wrong. Could it be the marzipan. I could only get the the brand Edde in a tube. Sorry to hear that. I don’t no that brand. But I have just found it on a webpage and I see there are 75 % sugar in the paste. I think the one we have in Denmark are about 50-60 % max. So if you wan’t to make it again you probably have to add less sugar in the recipe. Try using a bit less sugar. Can this cake be made for vegans? We are having a Christmas buffet on the 18th December and I would like to make this cake but my daughter is vegan. Hi Terri. I have not tried to make a vegan version of this cake. I think it might be difficult due to the egg whites – I’m actually not sure if something can substitute those? I would like to hear from you if you come up with a nice solution. Sorry – but need to know the measurement for sugar in cups. Also, how many egg whites? This is lovely! Thanks so much for posting it for us Scandinavians in US! I had a similar result as Susan experienced. Melted down to a pancake. I even tried just baking the marzipan before mixing and it did the same thing. Next time you try this, sub almond flour for the marzipan. Works a treat. I also add a tsp. of almond extract to give it the tiny bit of bitter almond you find in the premade marzipan. I bought the best marzipan I could get here (Canada) which claimed to be 50-50 and my dough, even after 3 hrs in the fridge, was still a batter. I added more marzipan and piped it into circles which totally flattened. I still had half the dough, so I kneaded in some cornstarch. I rolled out the dough, and it still flattened :( I think that, if you are going to make this in North America, you need to add ground almonds to your marzipan or even make your own marzipan. So disappointed! Ah yes they came out flat for me too! What an expensive disappointment. I think the recipe should say almond paste not marzipan perhaps? Hi. I’m sorry to hear about the result. Maybe the marzipan which is bought outside Denmark has a different ingredient list? I’ve just checked; the Danish marzipan is made from 63% almonds, sugar, water and a little glucose sirup. Maybe you can compare it to the marzipan you have? Pour water and sugar into a pot and let it simmer for 5 minutes. Remove the peel from the almonds and blend them to a very fine flour using a blender or food processor. Pour the almond flour into a bowl and add the sugarwater little by little while stirring/ kneading. Put the finished marcipan in a freezing bag or wrap it in baking paper and store it in the fridge until needed. Great description. I’m sure a lot of my readers of my blog can use this. Thanks!